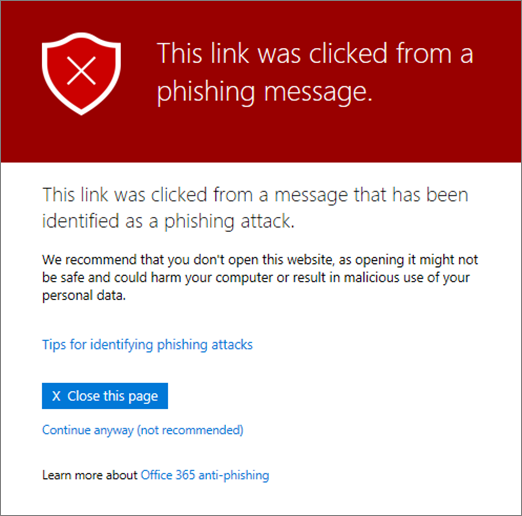 Office 365 Advanced Threat Protection (ATP) helps protect your organization from phishing attempts and malware through features, such as ATP Safe Links, ATP Safe Attachments, and anti-phishing protection. 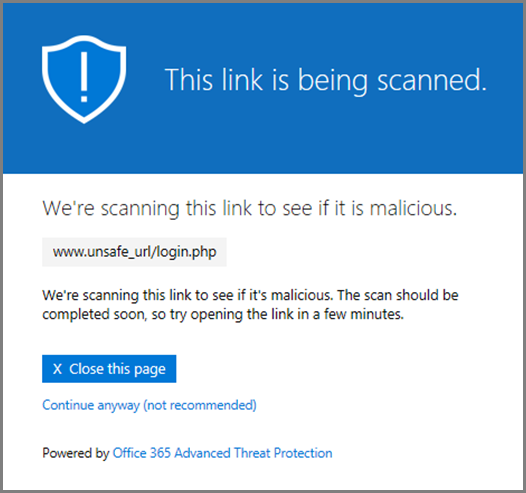 When protection is in place, links (URLs) in email messages and Office documents are checked. 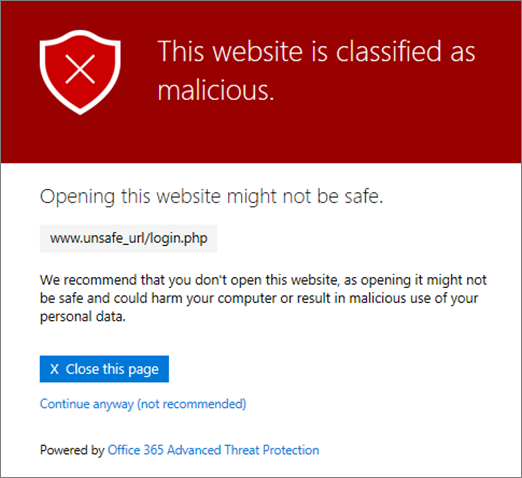 If a URL is identified as suspicious or malicious, you might be blocked from opening the URL when you click it. Instead of going directly to the site, you might see a warning page instead. 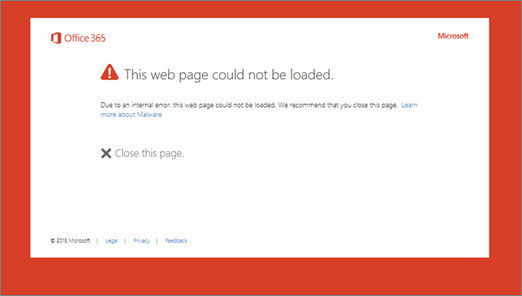 Read this article to see examples of warning pages that might appear, along with recent updates to warning pages. 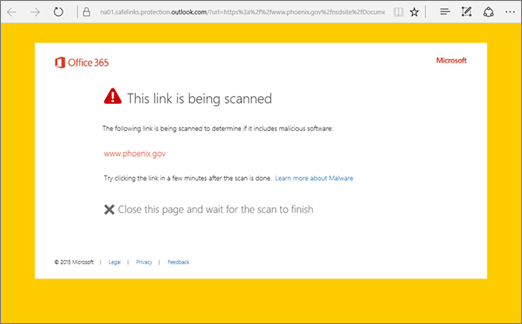 A URL is being scanned by ATP Safe Links. You might have to wait a few moments to try the link again. The URL is in an email message that seems similar to other email messages that are considered suspicious. We recommend that you double-check the email message before proceeding to the site. 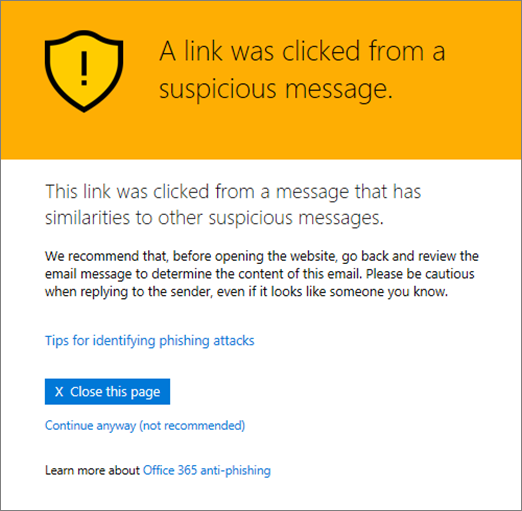 The URL is in an email message that has been identified as a phishing attack. As a result, all URLs in the email message are blocked. We recommend that you do not proceed to the site. 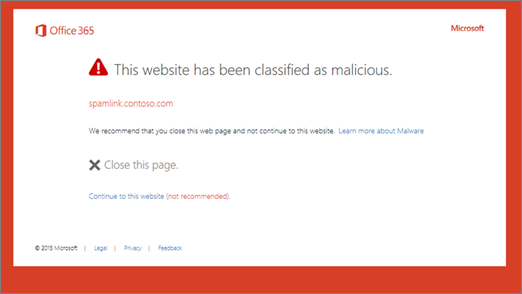 The URL points to a site that has been identified as malicious. We recommend that you do not proceed to the site. The URL is blocked for your organization. There are several reasons why a URL might be blocked. 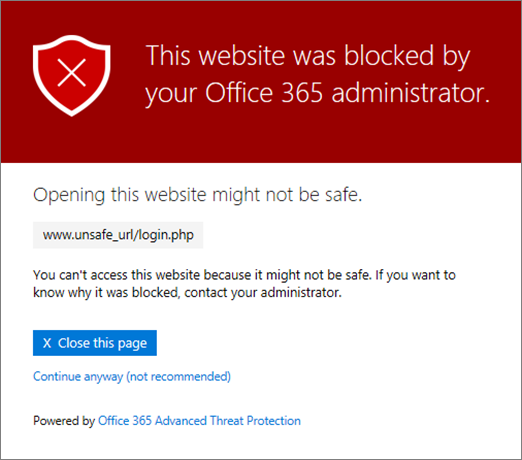 We recommend that you contact your organization's Office 365 administrator. Some kind of error has occurred, and the URL cannot be opened. 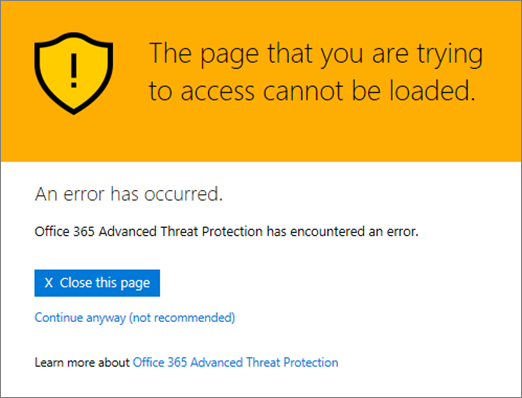 Several warning pages were recently updated for Office 365 ATP. If you're not already seeing the updated pages, you will soon. The updates include a new color scheme, more details, and the ability to proceed to a site despite the given warning and recommendations.